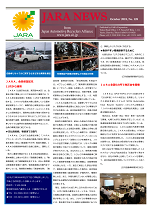 JARA Corporation communicates with the world in 4 languages, not only with Japan, through the monthly “JARA NEWS – Overseas Edition”, reporting on trends and news in the automotive recycling industry both in Japan and overseas. ・Make 2019 the year for chance! ・JARA denoting September as "Rebuilt Parts Month"
・Kubota Auto Parts hosts first "Field Trip for Children"
・<Welcome to JARA Partner Rebuilt Parts Maker> Urawa Industry, Matsui Universal Joint Corp.
・Carec opens new warehouse. The move is part of the company's efforts to stregnthen its sales structure in a way that will encompass full range of customers.